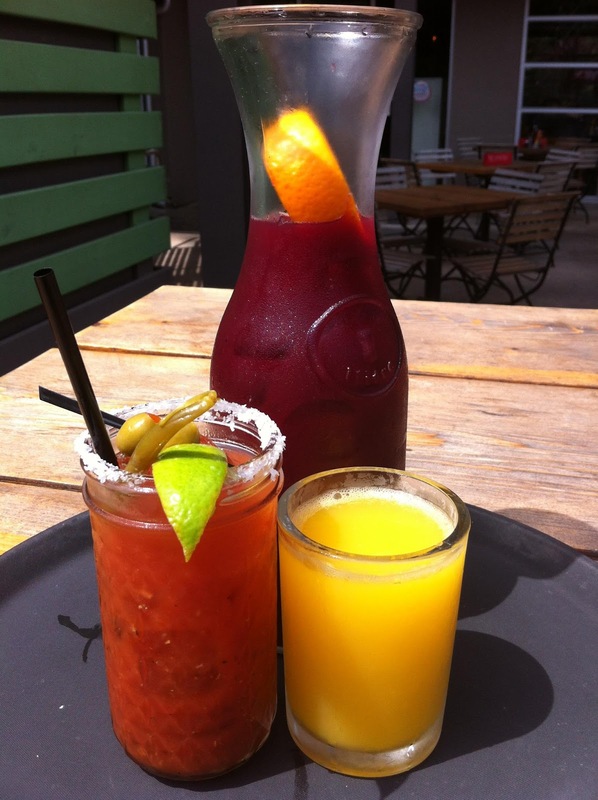 Happy hour prices will be honored until 7 p.m. Renew your membership before the meeting! Remember there are two parts to the registration process. - Sign up to attend on the website! Executive Council elections take place! Read about the candidates running. If you want to run for an officer position, you can still be a write-in candidate! Note: You must be a paid member to vote. Bring your finished Zipper Challenge entries to the meeting! 10 to 15 minute binding demos by guild members. 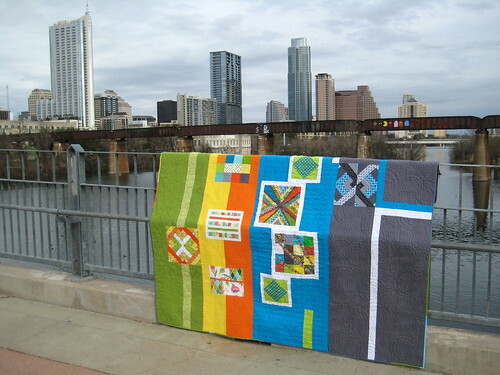 During the 2012-2013 fiscal year, the Austin MQG donated nine charity quilts! 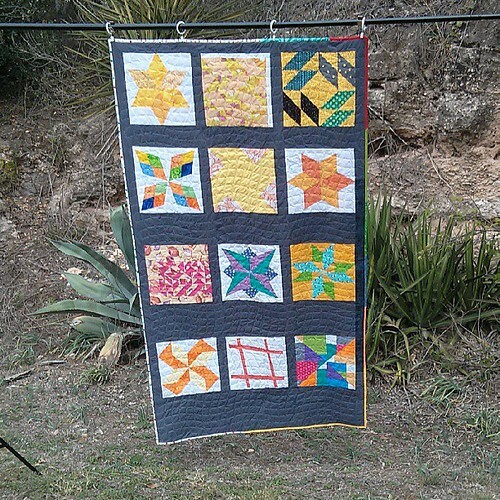 Members of the guild contributed blocks to this butterfly quilt. 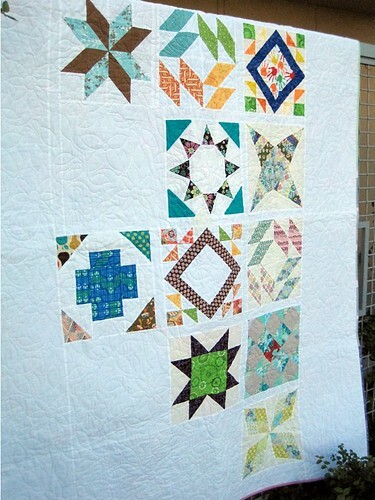 A tutorial for the block can be found at Fresh Lemons Quilts. Austin MQG donated the quilt to Friends of Annie, a charity founded by Jessica Darling of Remnants:fiber[culture]. 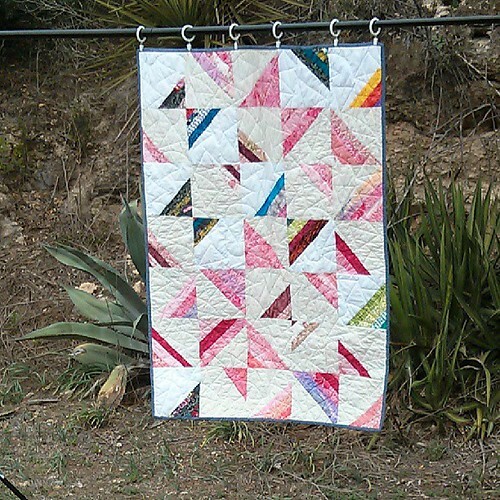 Thanks to Jessica Pierre’auguste for piecing the top and binding this quilt and to Jessica Darling for quilting it. 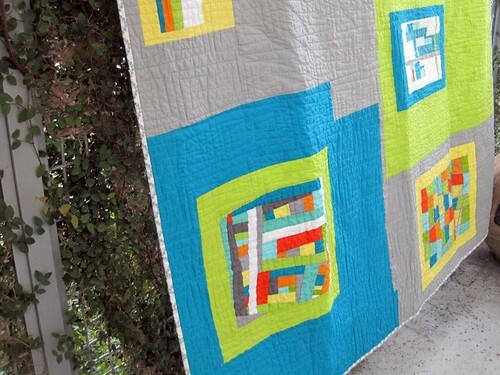 Members of the guild contributed blocks to these four Summer Sampler quilts. 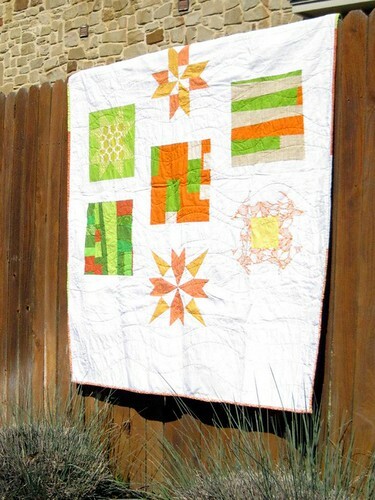 Tutorials for the blocks can be found at Freshly Pieced, Sew Bike Quilt, and Fresh Lemons Quilts. Austin MQG donated these four quilts to Foundation for the Homeless, a local charity which helps homeless families find a home–a safe space where they can sleep, play, learn, work and grow in the presence of loved ones. Thanks to those that pieced the quilt tops: Christine Smartt, Amanda Kattner, Jessica Pierre’auguste, and Kimberly Place. Thanks to those that quilted each quilt: Jessica Darling and Kimberly Place. 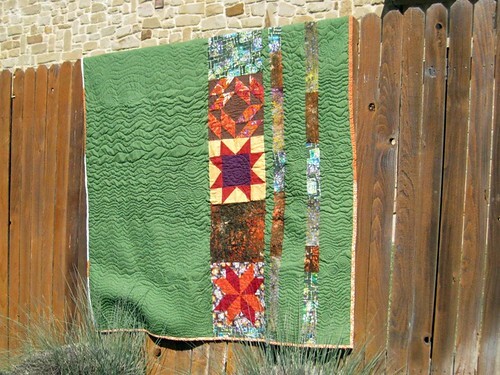 Members of the guild contributed blocks to these two Summer Sampler quilts. Austin MQG donated both of these quilts to an auction to raise money for Ronald McDonald House of Charities. You can read more about this donation here. Thanks to Claire Jain and Bobbi Brekke for piecing each top and Jessica Darling and Bobbi Brekke for quilting each quilt. Austin MQG pieced, quilted, and bound two quilts for the QuiltCon Block Challenge quilts. These blocks arrived from all over the world! 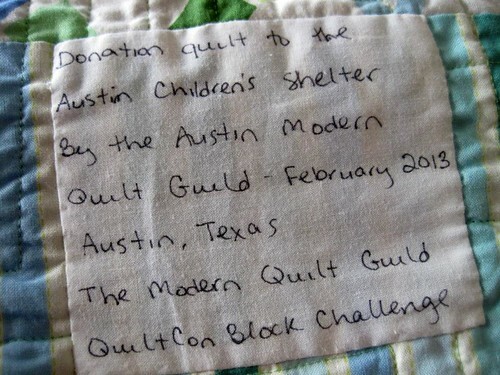 The quilts were donated to the Austin Children's Shelter as part of a large donation organized by QuiltCon. Thanks to Mary Anne Williams, Emily Thompson, and Christi Carew for piecing the tops and Laura Brown for quilting both quilts. Also, thank you to the wonderful local quilt shop, Stitch Lab, for donating the fabric for the quilt tops, backings and bindings. The Austin MQG will be electing new Executive Officers on June 12th! In order to get to know the candidates better, each one has provided a summary of why they want to represent you. This time last year, I had just made a major life-decision to accept a new position and move myself and my sewing machine to Austin, Texas. Being a member of the MQG helped to make that transition so much easier... by joining the Austin MQG Facebook page, I was able to get to know members before I even arrived in town! Now I am in the position to be able to give back to the Guild by serving as your President. 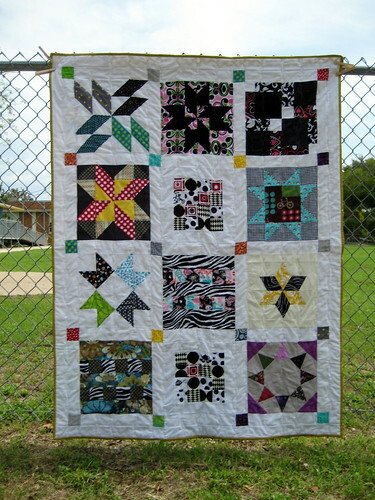 I want to encourage our new quilters to become involved in the Modern Quilt Movement. I want to meet more of you all that, like me, have been quilting for many years but are intrigued by the energy, interactive nature and aesthetic of the Modern Quilter I want to support our members who aspire to become part of the MQG industry and to help them celebrate their successes as they reach their goals. My vision is to engage all of our membership to help build Our Guild into one of the leading MQG chapters in the U.S. Over the next few months, I would love to hear your thoughts and ideas for the future and to share with you why I am uniquely qualified to lead the way. I know that we can achieve our goals together, and I look forward to working with you all to make it happen! My name is Rebecca Roach and I’m running for VP of Communications with four goals in mind- Transparency in Executive Council discussions and decisions, increased communication across the board, a successful transition to using the tools on the new Modern Quilt Guild website, and an increased outreach in community service. I’m already familiar with all of the social media tools that the guild has created, and I intend to greatly expand their use. In particular, I hope to make the AMQG blog a destination spot that is regularly updated with engaging content relevant to our members, including pre & post monthly meeting information (as well as Executive Council meetings) and detailed results of any surveys conducted on our membership. In addition, the creation of a monthly email newsletter will provide another outlet for the Executive Council to reach out to members and a Welcome Packet mailed to all members will become a tangible reference where they can read detailed Executive Council biographies and contact information, learn about all of the benefits & discounts that are available to them, and explore all of their opportunities to volunteer within the guild. A host of changes are going to happen when our guild officially joins the MQG, and I intend to drive that process as it relates to communications and guide our members through learning all of the new social features on the MQG website. Finally, I want to expand our community service efforts beyond quilt donations and give our membership opportunities to interact face to face with the people of Austin. I was born and raised in Oklahoma City and studied Forensic Science at Baylor University. I now live in Pflugerville with my husband (and cat) and work full-time at the Texas Department of Public Safety. In my spare time, I own a company called Frybread Quilts & Cuterie and design quilt patterns and sell gift and home décor items. 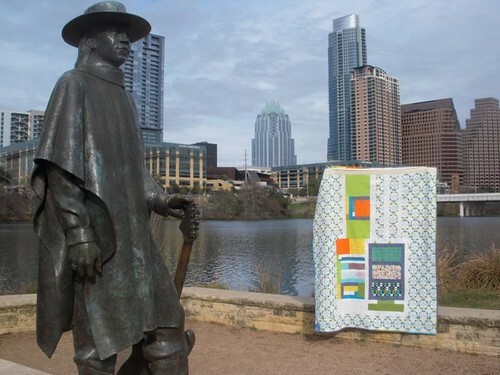 I’ve been an active quilter since 2004 and my work has been shown at the International Quilt Festival in Houston, QuiltCon, and the Dallas Quilt Celebration. I’ve been published in Quilting Arts Magazine and 101 Patchwork Projects and featured on blogs such as Craftzine, SewMamaSew, & Craft Gossip. I'd love to take part on the executive council so I can be a part of making our guild one of the best in the country! I would love to help the board get us involved in more events throughout the Austin community, including craft shows and vendor fairs. I also want to make sure all of our Wimberley Retreats happen, they are AMAZING and worth attending. I have a lot of ideas that span many of the executive council's position descriptions, so it would be great to be on the board to help make some of the ideas happen. I am a graphic designer, so that makes me a good fit for coordinating the yearbook as well. Maker of purses and designer of our logo. You know, that chick with the pink hair. I would like to increase my participation with the AMQG so I am seeking the executive council position of Treasurer. 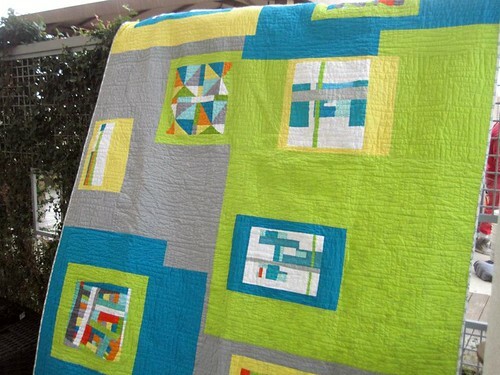 I began attending AMQG meetings in the Fall 2012, attended a retreat and enjoyed several workshops at QuiltCon. I love to learn new techniques, get inspired by other's work and meet modern quilters in the area! I have 8 years volunteer leadership experience with the Oak Hill Elementary PTA, a non-profit organization, serving as both a committee chair and executive board member. I have served as Vice President in charge of fundraising since 2011. During this time I have worked closely with our Treasurer to manage an annual budget of $80,000. I have also coordinated many of the school fundraising activities including partnerships with local business, direct giving campaign, annual carnival and silent auction, and many family events. My 2-year term as Vice President with the PTA ends June 2013. In addition to being a mom of two children, I work part-time in a fast paced medical practice handling financial records, insurance contracts and patient accounts. Hi! 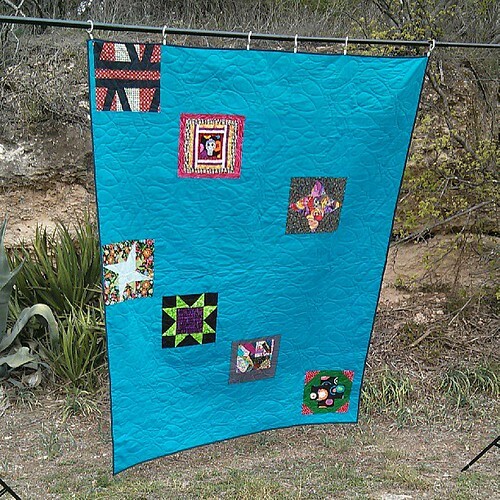 I'm Emily Thompson and I'm running for Secretary of the Austin Modern Quilt Guild because I am passionate about modern quilting and would love to help provide a positive guild experience for all members. I would make a great Secretary because I am well-organized, able to devote time to the organization, and I'm extremely detail oriented - hey, I'm a quilter, right?? Making lists is a favorite past time, and I also enjoy scrapbooking and would love to be in charge of keeping our photos in order over various types of social media. 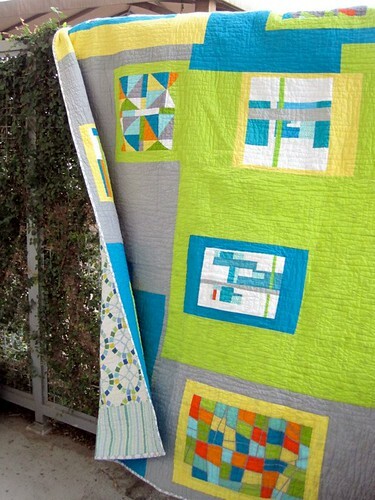 Originally from Illinois, I've moved around over the past few years and have been a member of the Oklahoma City Modern Quilt Guild and the Dallas Modern Quilt Guild before settling in Austin and joining our guild last fall. I'm an optometrist by day and quilter by night. Currently I live in northwest Austin with my Jason and brother, Dan, along with our crazy cats Carlton and Zoey. Make sure to renew your membership before the June 2013 meeting. Can't be at the meeting? You can vote via proxy until Tuesday June 11th. 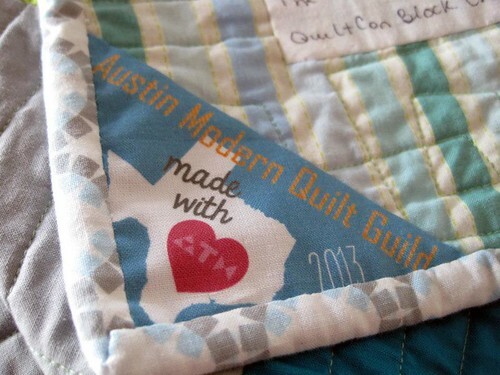 Contact Bobbi (secretary@austinmodernquiltguild.com) for a proxy vote. 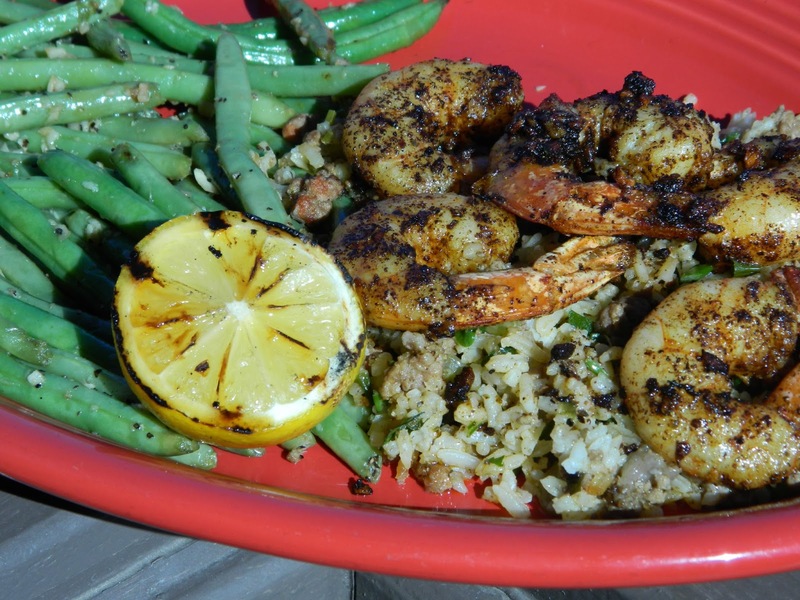 It's officially June, and our June 12th meeting will be here, soon! If you attended the May meeting, you received three zippers provided to us by Coats & Clark to participate in the Zipper Challenge. If you couldn't attend and would like to get a set of zippers, email me (Claire) at programming@austinmodernquiltguild.com or Jessica at communications@austinmodernquiltguild.com. 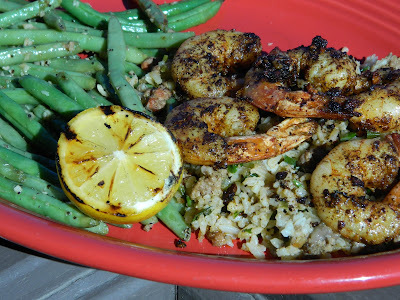 I'm located in central Austin, and Jessica is up north. If you paid dues for 2012-2013 or if you have already paid dues for 2013-2014, you're eligible to receive a set of zippers and enter the contest to win a fat eighth bundle ten of Shot Cottons valued at $30. - For your project to be eligible, you must use at least one of the provided zippers but you don't have to use all three. - You can add additional zippers to your project other than the ones provided. - Bring your finished project to the June meeting and set it out on the Zipper Challenge table for voting. - We'll vote on the winning project like we did for the Madrona Road Challenge. Comment here, on facebook, or email us if you have any questions. I can't wait to see the great projects at the June meeting!